Other than skin cancer, breast cancer is the most common cancer among American women. Getting mammograms regularly can lower the risk of dying from breast cancer. The United States Task Force recommends that if you are 50 to 74 years old, be sure to have a screening mammogram every two years. 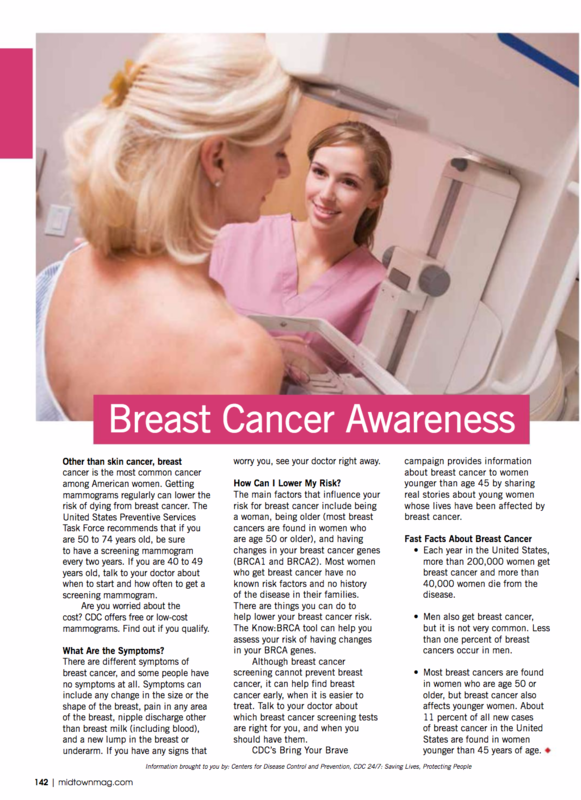 If you are 40 to 49 years old, talk to your doctor about when to start and how often to get a screening mammogram. The main factors that influence your risk for breast cancer include being a woman, being older (most breast cancers are found in women who are age 50 or older), and having changes in your breast cancer genes (BRCA1 and BRCA2). Most women who get breast cancer have no known risk factors and no history of the disease in their families. There are things you can do to help lower your breast cancer risk. The Know: BRCA tool can help you assess your risk of having changes in your BRCA genes. -Each year in the United States more than 200,000 women get breast cancer and more than 40,000 women die from the disease. -Men also get breast cancer, but it is not very common. Less than one percent of breast cancers occur in men. -Most breast cancers are found in women who are age 50 or older, but breast cancer also affects younger women. About 11 percent of all new cases of breast cancer in the United States are found in women younger than 45 years of age.